This article will focus on Destiny’s Exotic chest armor. When the House of Wolves is released, Warlocks will also have Purifier Robes. Warlocks don’t (currently) have any Exotic boots, so it appears they’re the only class getting a new chest piece. 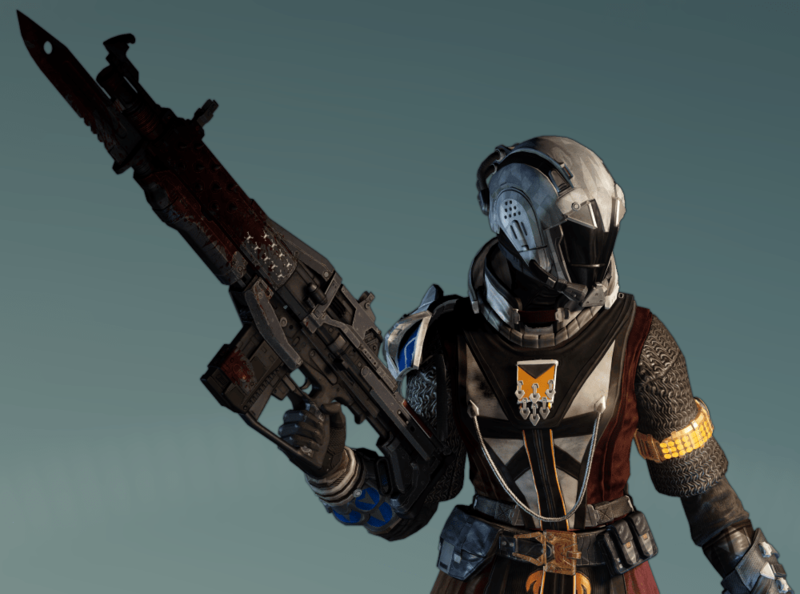 If you’d like to learn more about the Exotic gauntlets, click here. We also have reviews for each of the Exotic helmets for the Hunter, Warlock, and Titan. 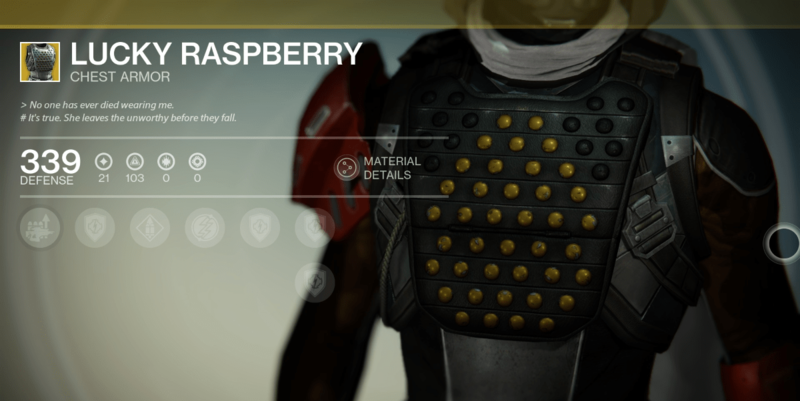 Lucky Raspberry is the only chest piece specific to the Bladedancer. Lucky Raspberry’s main feature is the ability to spawn with grenade energy, allowing you to use your (more powerful) grenade more often. Along with the grenade energy, your Arcbolt grenade will be improved by chaining further. You’ll be able to spawn with full grenade energy with any grenade, not just the Arcbolt grenade. There’s only 2 Hunter Chests in the game right now, and this one is arguably better – especially with a good fusion rifle like Plan C or Vex Mythoclast, as it’ll greatly increase the ammo. For theVex Mythoclast, it bumps up the ammo reserve to 189 from its default 147. The extra heavy weapon ammo unfortunately does not stack with other armor that provides the same perk, such as the Tireless Striders. The extra range on the Arcbolt grenade is nice, but Improved Arcbolt Grenade will really be helpful in PvP for that immediate grenade when you respawn. Remember: it’ll work with any grenade. It’s somewhat niche, and is outclassed by some of the other Hunter Exotics, but for those of you who would benefit from the extra ammo and prefer using the Arcbolt grenade, this is worth using, at least until you have a helmet replacement. Keeper of the Pack – You revive fallen teammates faster, and they revive you faster. Your Super also spawns additional orbs for teammates. Crest of Alpha Lupi is most likely a reference to the brightest star in the constellation, Lupus. If you are a team player in PvP, this chest could swing 3v3 matches in your favor. Of course being able to revive quicker in PvE is beneficial too, especially when you’re pressed for time. This piece of armor is a subclass-neutral. As with each of the Exotic chests, you’ll get additional ammo for your weapons. Unfortunately this chest specifically helps out hand cannon users, so that might make it less useful for you if you barely (or never) use hand cannons. As you can see in the video, Timur’s Lash got an ammo reserve increase of 20. Keeper of the Pack cuts the revive time by about .6 seconds, allowing you to revive fallen Guardians (or them to revive you) in just 1 second. The additional Orb generation it provides isn’t the same all the time, but from Gunslinger testing, it produced just 1 extra. The additional Strength, reducing the melee ability cooldown, seems out of place but with a high enough stat roll it could reduce it significantly. If you do not play 3v3 PvP, or usually play by yourself in PvE, this isn’t the chest for you. Keeper of the Pack is medic-like and support orientated, so it’ll benefit your teammates more than it’ll benefit you specifically. The Voidfang Vestments is the only Voidwalker-specific exotic chest piece. The Improved Axion Bolt perk will buff the (amazing) Axion Bolt grenades, which means more consistent kills. This chest will work for the Sunsinger as well, because with the Gift of the Sun talent, it will spawn 2 grenades for you. The full grenade energy you get from Improved Axion Bolt will also work with any grenade, not just the Axion Bolt. If you are playing as a Voidwalker, combining the Improved Axion Bolt perk with the Vortex Mastery ability (which increases the range of Axion Bolt) will make your grenades lethal and better at clearing out larger areas. Because the Voidfang Vestments give you Strength, your Energy Drain or Scorch abilities will recharge quicker. This works well in tandem with a Voidwalker as Energy Drain reduces grenade cooldown, giving you another Axion Bolt grenade very quickly. This is a good option if you’re a Voidwalker, especially if you use hand cannons. Along with spawning with full grenade energy, the Strength stat will reduce your melee cooldown time, making it an all around great choice. As with the Crest of Alpha Lupi, this is a better choice for PvP than PvE. If you don’t participate in the Crucible, the Skull of Dire Ahamkara, Claws of Ahamkara, or Obsidian Mind might be a better option (if Xûr cooperates). When the House of Wolves is released, Voidwalkers will also have access to Nothing Manacles. Cosmetically, the Voidfang Vestments look great and work well with a large number of shaders. Heavy Weapon Ammo – Increases the amount of Heavy Weapons ammunition you can carry. Praise the Sun – Further decreases all ability cooldowns while Radiance is active. Heart of the Praxic Fire is easily one of the most sought after Exotic armor pieces. This chest is specific for Sunsinger, as it requires Radiance to take advantage of Praise the Sun. With the right skills selected, you can become an infinite grenade/scorch machine when Radiance is active. Which grenade type to use is really a personal preference, but the ability to completely deny areas with Solar grenades while using this armor is very useful in both PvP & PvE. Add Flame Shield, Radiant Will, and Gift of the Sun to really give you an edge. Furthermore, if you’re with another Sunsinger with this chest, Praise the Sun is affected by other Sunsingers’ Song of Flame. This chest piece is one of the few that will give you purely Disciple, which will help decrease your grenade cooldowns, even when Radiance isn’t active. The Praise the Sun perk will decrease your Grenade and Melee cooldowns by about 25%. There isn’t an exact amount of time for this, as your cooldown speed will vary based on your armor’s stats. Heart of the Praxic Fire is excellent in PvE for taking out large numbers of enemies very quickly. It can also be very useful in PvP is your play still is to get up close and personal with the help of Scorch and grenades. The extra fusion rifle ammo will be perfect for the Vex Mythoclast. For those Warlocks concerned about style, this chest really does look amazing. The chainmail arms and the medieval design stylings will make you look like a flaming space knight. It’s description is a reference to Knight Solaire, from the Dark Souls game. Starfire Protocol – Gain an additional Fusion Grenade. 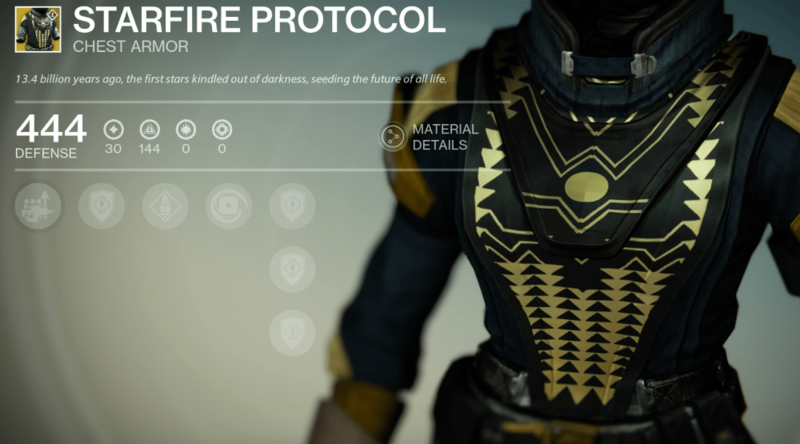 Starfire Protocol was the only Exotic chest that was introduced with The Dark Below expansion. Purifier Robes and The Ram are coming with the House of Wolves, also for the Sunsinger. Starfire Protocol’s main perk will give you an additional fusion grenade, but this does not stack with the Gift of the Sun talent, so you can only hold 2 grenades. While this does pigeonhole you into taking Fusion grenades, it does free up the Angel of Light or Touch of Flame talent. Touch of Flame allows your Fusion grenades to always ignite enemies, and in PvP this will help finish off anyone who you failed to stick the grenade to. Double this with Viking Funeral for extra ignite damage! 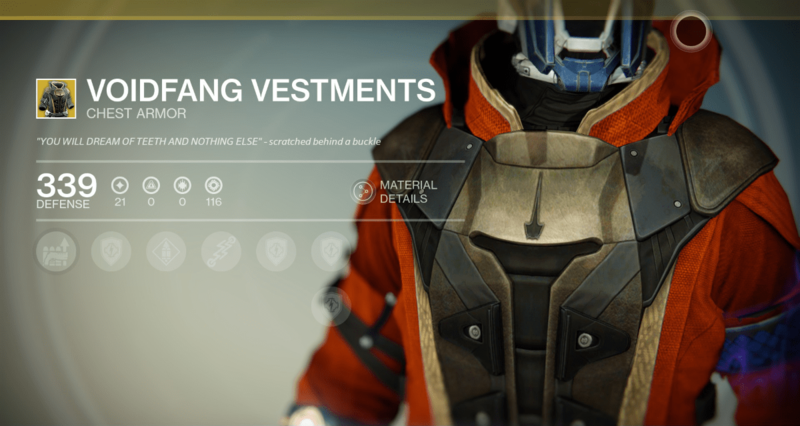 This chest piece will also increase your fusion rifle ammo and heavy ammo reserves, similar to the Heart of the Praxic Fire. Forgetting about the increased ammo you can carry, this chest piece is worth buying for the additional Fusion grenade alone, assuming you enjoy using that grenade. The Fusion grenade deals 100 damage in a small blast radius and an additional 65 bonus damage when stuck to a target. The Intellect on this armor increase the charge rate of Radiance, getting your double Fusion grenades back quicker than they would normally. For this chest, it comes down to how much you enjoy the Fusion grenades. If you prefer Solar or Firebolt, the Heart of the Praxic Fire or Sunbreakers might be a better Exotic option. Auto Rifle Ammo – Increases the amount of Auto Rifle ammunition you can carry. Crest of Alpha Lupi (subclass-neutral) has perks very similar to the Hunter’s Crest of Alpha Lupi. They’re both for those Guardians that love team-oriented play. While it won’t be incredibly useful in the raid, this chest piece really holds its own in 3v3 and Strikes. It makes any resurrection near instant (1 second from 1.6), and is wonderful for those clutch saves. The additional Orbs aren’t that noticeable unfortunately; only about 1-2 extra. Depending on how much Intellect you get, the cooldown for your Ward of Dawn or Fist of Havoc could be greatly reduced. Its two ammo perks are universally useful and will be extremely beneficial to those who enjoy AR’s. Is it better than The Armamentarium? We don’t think so. However, the Crest of Alpha Lupi is still a solid choice and it’s worth adding to your collection. As stated above, if you’re a solo player, Keeper of the Pack isn’t going to benefit you at all. Just like with all Exotics, some are going to be most useful in select situations, so just know when to switch out for something that will benefit you more. An additional grenade, with more heavy and special ammo (about 40% more) means you’re a walking armory, ready to throw some serious punches. With a high amount of Discipline you’ll be able to use your grenades faster too, which is always a good thing. A second grenade is so useful in any and all situations. With 140 Discipline your cooldown will be reduced by roughly 4 seconds. 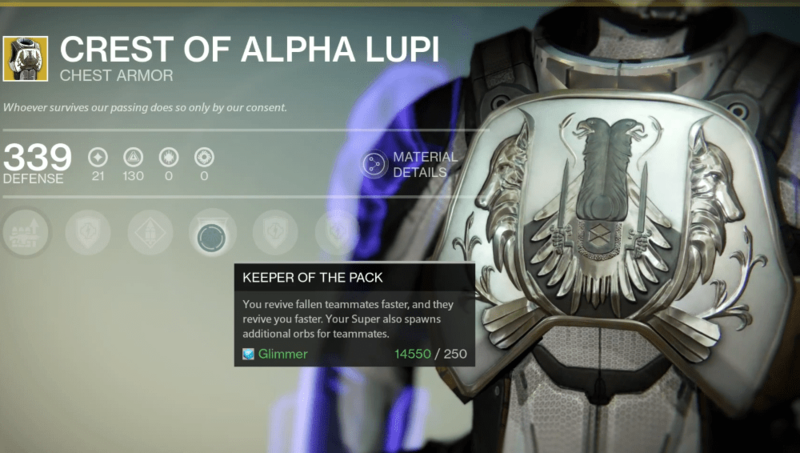 This chest is similar to the Crest of Alpha Lupi, in that it doesn’t provide any subclass specific upgrades – so feel free to use this on a Defender or Striker. The perks are so great because they don’t limit you to a specific secondary weapon or particular grenade type, while giving the added bonus of holding more heavy ammo. The double grenade feature is especially beneficial to the Striker since they can crowd control with the AoE Pulse or Lightning Grenades and disorient enemies with the Flashbang. Aesthetically, this chest makes you feel like a soldier on the battlefield with its military camouflage fatigue and dual grenades hanging on the chest. This is the ultimate Titan’s chest piece. Even if you’re not using your heavy and special weapon a lot, it’s still amazing because of its high discipline and additional grenade! 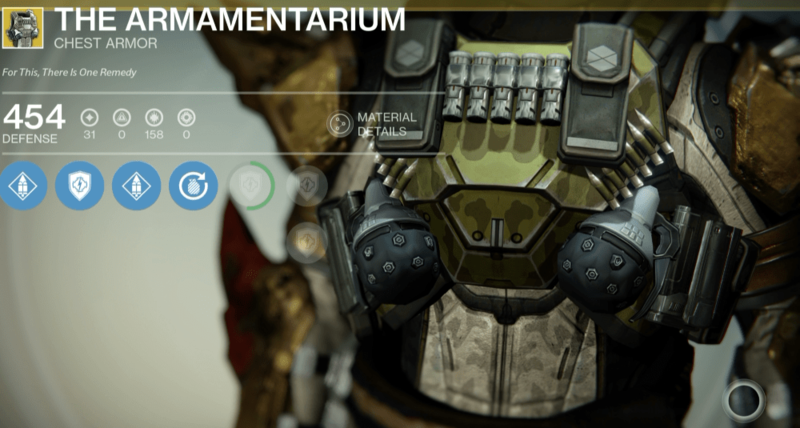 For those curious, “Armamentarium” means “the medicines, equipment, and techniques available to a medical practitioner.” The chest is the equipment, and you’re the ‘medical’ Titan, prescribing grenades for your enemies.